Reva, which sells the NXR electric car, shown, could build EVs in a Lancia plant in Sicily. TURIN (Bloomberg) --Mahindra & Mahindra Ltd., India's largest SUV maker, may back Italian financier Simone Cimino's plan to build electric cars at Fiat's Termini Imerese car factory in Sicily. Cimino is planning to invest as much as 450 million euros ($602 million) and has a preliminary agreement with Reva Electric Car Co. to build electric cars at Termini. 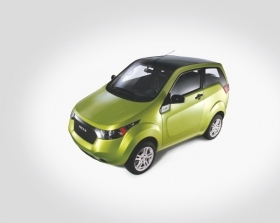 Mahindra in May agreed to buy 55 percent of Reva, a closely held company based in Bangalore, India. Pawan Goenka, president of Mahindra's automotive and farm-equipment unit, said he's had “positive discussions” with Cimino and that a plan for the Sicilian factory was part of the talks. Fiat plans to stop production at the Termini unprofitable factory, which employs 1,400 people and assembles the Lancia Ypsilon model, by the end of 2011. Fiat loses 1,000 euros on every car produced at the plant, partly due to a lack of infrastructure and the high cost of shipping parts to the island. “We have the financial strength to develop the plant and absorb the work force,” Cimino said. Private-equity funds that he manages may contribute as much as 100 million euros to the project. Invitalia S.p.A., an adviser to Italy's Industry Ministry, plans to announce a shortlist of bidders for the Termini plant. The Italian government also plans to meet union officials and Fiat representatives this week in Rome for an update on the situation. The Termini plant was built in 1970 in one of the poorest regions of the country. Fiat plans to invest 20 billion euros through 2014 to improve factories and vehicle development in Italy, where productivity lags its plants in Brazil and Poland. CEO Sergio Marchionne wants to lift production in Fiat's home market to as many as 1.4 million passengers cars a year by 2014. The company is Italy's biggest manufacturer. Cimino, a former Montedison S.p.A. executive, is CEO of private-equity fund Cape Natixis Sgr S.p.A. His project, which could involve as much as 900 million euros in total investments, calls for developing electric cars and solar-recharge capability in Sicily. Cimino, 49, said he may hire up to 3,500 people, including workers from the Fiat plant.